Saab Seaeye has enhanced its remotely operated vehicle ‘Falcon’ with its advanced iCON behaviour-based intelligent control architecture. Namely, the Falcon can now host many new features, making it an advanced platform for further automation and behaviour-based software development. Visit http://subseaworldnews.com/2017/02/10/saab-seaeye-upgrades-falcon-rov/ to view the full article online. At Underwater Intervention, elections saw General Members, Crofton Diving and EPIC Divers and Marine retain their seats on the ADCI Board of Directors, and Broco has assumed the Associate Member seat previously held by Divers Supply Inc. I want to thank Robbie Mistretta (Divers Supply Inc.) for all of his hard work while serving as the Association's Treasurer for the past 10 years. Robbie also does extensive work to provide the Association with insights into equipment maintenance, inspection, and testing. This is especially valuable when we look to make revisions to the International Consensus Standards for Commercial Diving and Underwater Operations. As for the Officers of the Board for 2017, Bryan Nicholls (U.S. Underwater Services, LLC) has been elected President, Jay Crofton (Crofton Diving Corporation) is 1st Vice President, Bo Ristic (Chet Morrison Contractors, LLC) is 2nd Vice President, and Bruce Trader (MADCON Corporation) will serve as Treasurer. Claudio Castro (Chilean Chapter Chairman, STS Chile) will serve as the International Executive Board Representative, and Craig Fortenbery (Mainstream Commercial Divers, Inc.) will serve on the Executive Board as Past President. Visit https://www.naylornetwork.com/adc-nwl/articles/index-v5.asp?aid=430470&issueID=45205 to view the full article online. The Great Lakes Water Studies Institute is hosting an ADCI Certified ROV Pilot Technician Professional Training Program March 6 - May 6, 2017. The cost of the program is $10,600, which includes all tuition, books and fees. The program is limited to 10 participants and local housing options are available. For more information about the program entrance requirements or to register for the program, click the learn more link below. Visit http://www.naylornetwork.com/adc-nwl/pdf/NMC_ADCI_ROV_training_registration_2017.pdf to view the full article online. The January/February issue of Underwater Magazine is online now. This issue features stories on industry topics ranging from the State of the ROV/AUV Industry, the ADCI Audit Initiative, The Dangers of PTSD and Diving and the 2017 ROV/AUV Pictorial. All of this and much more in the latest issue of Underwater Magazine. Visit http://www.nxtbook.com/naylor/ADCS/ADCS0117/index.php to view the full article online. 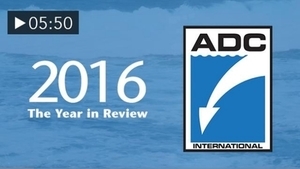 2016 was a landmark year for the ADCI. The latest ADCI-TV video highlights some of the most important achievements of the association in the last year. CMAS announces the joining of the Fujairah International Marine Sports Club ("FIMSC") as new UAE member federation. The announcement was given during a press conference held on the 26th of February in Fujairah under the auspices of H.H Sheik Mohammed bin Ahmad al Sharqi, Crown Prince of Fujairah, and of H.H. Sheik Saif bin Hamad al Sharqi, Chairman of the FIMC. The press conference was attended by Major Ahmed Ebrahiem, FIMC General Manger and Mrs Anna Arzhanova President of CMAS, accompanied by CMAS legal advisor Mr. Riccardo La Cognata. Visit https://www.olimpopress.it/underwater-activities-fujairah-international-marine-sports-club-joins-cmas/ to view the full article online. Aberdeen-headquartered Hydro Group has announced partnership agreement with MacTaggart Scott Australia. The partnership is focused on consolidating Hydro Group’s current work on the Royal Australian Navy Collins class submarines and to extend its services to aid the Australian capability for future submarine and future frigate. In addition, the company will offer its marine cabling systems. Visit http://subseaworldnews.com/2017/03/06/hydro-group-partners-with-mactaggart-scott-in-australia/ to view the full article online. Aberdeenshire-based ROV solutions provider, Aleron Ltd has boosted its international credentials, with the announcement of two contract wins in the North Africa region for its group companies, Aleron Subsea Ltd and ROVQUIP Ltd.
Visit https://www.oilvoice.com/Press/2786/Aleron-Ltd-broadens-horizons-with-North-Africa-contracts-announcement to view the full article online. Oceaneering International, Inc. announced that Roderick A. Larson, who currently serves as Oceaneering’s President, has been designated to succeed M. Kevin McEvoy as Chief Executive Officer ("CEO"), immediately following Oceaneering’s 2017 Annual Meeting of Shareholders, which is scheduled to be held on May 5, 2017. Visit http://www.oceaneering.com/22181/oceaneering-announces-rod-larson-succeed-kevin-mcevoy-ceo/ to view the full article online. Manufacturer of electric underwater robotic systems Saab Seaeye has launched a recruitment drive to find software and electrical engineers at all levels, including senior engineering management, for its Fareham, Portsmouth, Head Office and manufacturing base. Visit http://www.marinetechnologynews.com/news/seaeye-invests-engineers-545555 to view the full article online. Lariat Partners, a Denver-based private equity firm, announced that its portfolio company Subsea Global Solutions (SGS) has acquired All-Sea Underwater Solutions (All-Sea), creating a global leader in providing underwater ship maintenance, repair and marine construction solutions. Visit http://www.prnewswire.com/news-releases/subsea-global-solutions-acquisition-of-all-sea-underwater-solutions-300417784.html to view the full article online. Bibby Offshore, a leading subsea services provider to the oil and gas industry, announces the promotion of Allan Nairn to Director of Diving. Allan joined Bibby Diving Services in 2010 as Offshore Project Manager with over 30 years’ experience in the subsea sector. In his new role, Allan will be responsible for leading all diving related activity within the business. He will ensure day to day diving operations are executed safely, efficiently and continue to meet the high standards Bibby Offshore is known for. Visit http://www.yoursubseanews.com/bibby+offshore+appoints+director+of+diving_140618.html to view the full article online.